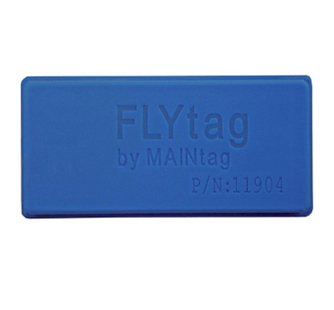 FLYtag, the best-selling flyable RFID parts marking solution, is the choice of the leading aircraft manufacturers and subsystem suppliers of the aerospace industry. 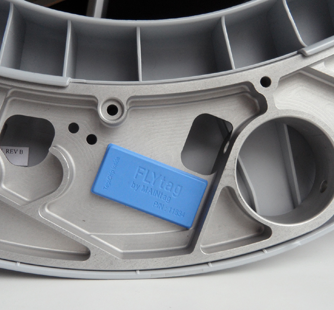 FLYtag is a flyable UHF RFID tag using In-Mold Airless Tagging technology. It is suitable for aircraft parts marking in harsh environments and on a variety of surfaces. FLYtag is built around Multi-record (8 Kbytes) passive contactless UHF technology meeting ISO 18000-6C and ATA Spec 2000 Chap. 9-5 and Appendix 11 standards. Data retention is over 30 years at 85°C. The ultra rugged packaging and chip are designed for extreme environments and comply with AS5678 requirements as well as Airbus A350 XWB specifications. It is capable of withstanding extreme temperatures (-55°C/+150°C) and pressure (194 hPa). It is also appropriate for use in pressurized and non-pressurized area. Communication with the chip, including access to all user memory, can be performed by any standard Gen2-compatible reader. FLYtag supports all mandatory functionalities and modes as defined by the ISO/IEC 18000-6 Type C (EPCglobal Gen2) air interface specifications, including Miller encoding. Proprietary or non-standard commands are never necessary.
. Non-volatile, read and write access. Configurable for different applications. FLYtag®, selected by Airbus for the A350 XWB’s first RFID parts marking program, has become the standard for the aviation industry. FLYtags are designed for identification and maintenance, repair and overhaul tracking applications throughout the civil and military aircraft and aerospace industries.